PHUKET: One of the most typical promises regularly flouted by Phuket officials is to “prioritise the safety and security of tourists”. All-too-often such reassurances turn out to be mere lip service. Teerwat died after he crashed his vehicle into the back of a crane truck on the bypass road, and though his Chinese passengers were “lucky” to have escaped the same fate, the incident is yet another firm reminder that the safety of tourists on Phuket roads is not, and has not been, a priority. Are all the officials who claim to be concerned with the well-being of tourists oblivious to the fact that most taxi, minivan and coach drivers chauffeuring tourists around are driving recklessly, fearless of the law, never mind their own demise. Surely these officials use the same roads in Phuket, particularly of Thepkrasattri Rd, the main artery to and from the airport, along which many of the reckless-driving accidents happen. Any driver who has travelled on this route can attest to how nerve-wracking it can be to share the roads with these reckless transport operators, particularly those either going to or coming from the airport. If the island’s policy makers and enforcers are unconvinced, surely it would take no more than a 10-minute inspection – along Chao Fa West, Chalermprakiet Ror IX or Thepkrasattri roads, near the airport turn-off. We are confident that in that short space of time, on any given day, they’d see first-hand just how reckless these tourist chauffeurs can be, and then perhaps they might understand why more and more foreign visitors are starting to have reservations about returning to Phuket. Or perhaps we’re just being “alarmist” and such accidents represent “just another day in paradise”, as stated by a number of The Phuket News readers commenting on these recurring news stories. 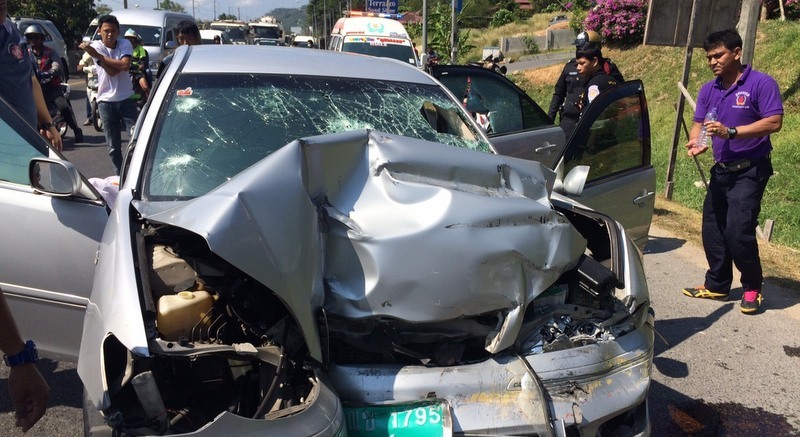 Still, unless something is done to remove the “speed demons” from our roads, and safer, dependable transport alternatives are offered, then more reckless-driving tragedies will continue to add nails to the coffin of Phuket’s already badly-tarnished safety record. These drivers have no fear, and I mean fear of being fined / losing their Licence / or job. I leave to the good readers to question why they have no fear! Thai transport drivers are total jackass's, never put your life in the hands of one unless you're suicidal. The most dangerous holiday hours on Phuket for a tourist are the travels by taxi or minivan from Phuket Airport to hotel and v.v. Of course also the tour busses with failing brakes on Phuket's hills may not be forgotten. It is time Phuket authorities start to handle it according the thai laws. How? Simple, start up law enforcement. For sure it would improve the image of Phuket. I fully agree with this article and it is not alarmist, on the contrary it is very factual. And what about Patak Road where the speed is quite excessive and there are no sidewalks for pedestrians. Every time you walk on that road, you risk your life and yet nobody cares. It is simply pathetic to see how stupid the drivers can be here.